Finding out that bed bugs are taking over your home is never a good experience. But you don't need to worry-leave the problem to the bed bug control team at Truly Nolen Pest Control - Ocean County. 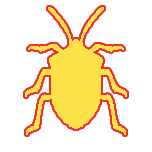 In addition to treating the infestation from your Brick & Toms RIver, NJ-area home, our bed bug treatment also addresses future infestations. You'll appreciate the simple process. After leaving your house for a few hours, you can return to a bed bug-free home. Don't like chemicals? That's not a problem. Just call us now and ask about our natural bed bug treatment options. You know that bed bugs are hard to find and even more difficult to remove. The skilled exterminators at Truly Nolen Pest Control know that early detection can drastically minimize infestations. If you see any of those indicators, contact us right away. Our bed bug control team will respond quickly so you can rest easy.